A driver involved in a car accident in Washington state that results in injury or death of any person or damage to property of any one person greater than $1,000 must make a written report of the accident to the chief of police, county sheriff, or state patrol within four days of the incident. That obligation is waived if a report is made to a law enforcement officer at the time of the accident. According to 2017 WSDOT data, a car accident occurs every 4 minutes and a person dies due to a car crash every 20 hours. Fatal crashes went from 508 in 2016 to 525 in 2017, resulting in the death of 555 people. This number has stayed relatively steady for the past decade. The highest number of crashes occur on Saturdays. The month of November held the highest number of crashes throughout the year. People in the 16-25 age group were the most at risk for being killed in a car accident. According to WSDOT, the number of car accidents with suspected serious injuries totaled 1,932 for the year 2017. 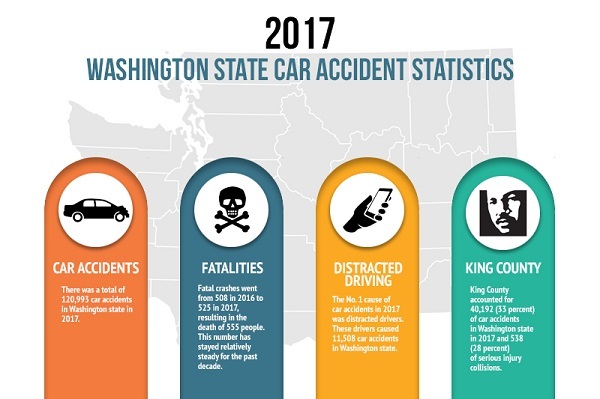 King County accounted for 40,192 (33 percent) of car accidents in Washington state in 2017 and 538 (28 percent) of serious injury collisions. A person was injured in a crash about every 15 minutes. *Large truck accident data is for 2016. Note: Car accident statistics take time to calculate. We will keep up to date on the latest numbers released. 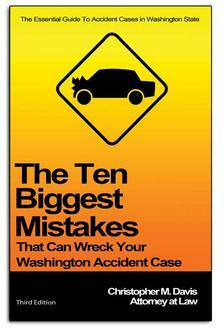 Check back here for the latest Washington state car accident statistics. Washington State Department of Transportation: This Twitter stream regularly tweets crash details and traffic information. Washington State Department of Transportation: WSDOT sends traffic alerts to this webpage.